Congleton, Cheshire November 12th 2018, Mirror Indicate (Mi) is the first cycling accessory to make the ‘life saving manoeuvre’ second nature to any cyclist. Mirror, signal, manoeuvre is one of the compulsory skills both car drivers and motorcyclists must master to gain their license and the Cheshire based company is convinced it has made a major breakthrough in road safety for cyclists. The wearable technology incorporates a combined mirror and indicator designed to address the dangers of road junctions where 75% of pedal cyclists are injured and the given cause of these accidents is where over half the cyclists and two thirds of motorists ‘failed to look properly’. 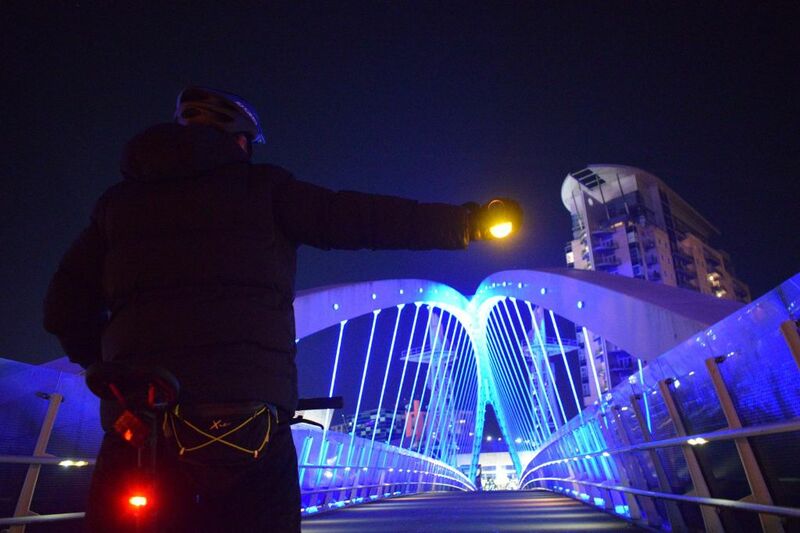 Fitting on the right hand Mi features a shatterproof mirror that gives cyclists a clear view of traffic behind and a single action feature to activate the indicator, which have the brightest commercially available LED lights to ensure high visibility when it’s most needed. The introductory retail price is GBP £44.95 plus postage and is available direct from http://mirrorindicate.com. Each unit is waterproof, lightweight, durable and robust and UK manufactured. Two fitted CR2023 batteries provide power for the LEDs emitting over 100 lumens refracted through a high visibility lens directing light to the front, side and rear of the cyclist, providing daytime visibility and exceptional visibility at dusk and night. The unit has a tactile quality whilst an armadillo coating ensures the acrylic and shatterproof mirror is scratch resistant. An elasticated velcro hand strap allows the Mi to be also worn over thick winter gloves. Each Mi comes with a comprehensive instruction manual, activatation magnet for handlebar mounting and robust packaging designed to fit through a standard letter box. As cyclists approach a right turn or roundabout raising the Mi on the right hand over the activation magnet on the handlebar automatically activates the indicator and holding the mirror at eye level provides a full view of any traffic approaching from the rear before extending the arm fully to begin moving to the right hand side of the lane. Naturally most cyclists will also glance over their shoulder to confirm the road conditions are safe. When the arm returns to the handlebar passing the magnet the device is automatically switched off again. Mirror Indicate’s route to market is a function of both practical innovation and commercial pragmatism. Those bike rides also helped Paul visualise what would help with making turning right safer. What’s more is that after fruitlessly searching for anything that would help him, the idea of a mirror and indicator on the right hand took form in the shape of early prototypes. “The mirror worn on the right hand made such a difference to me on the road. 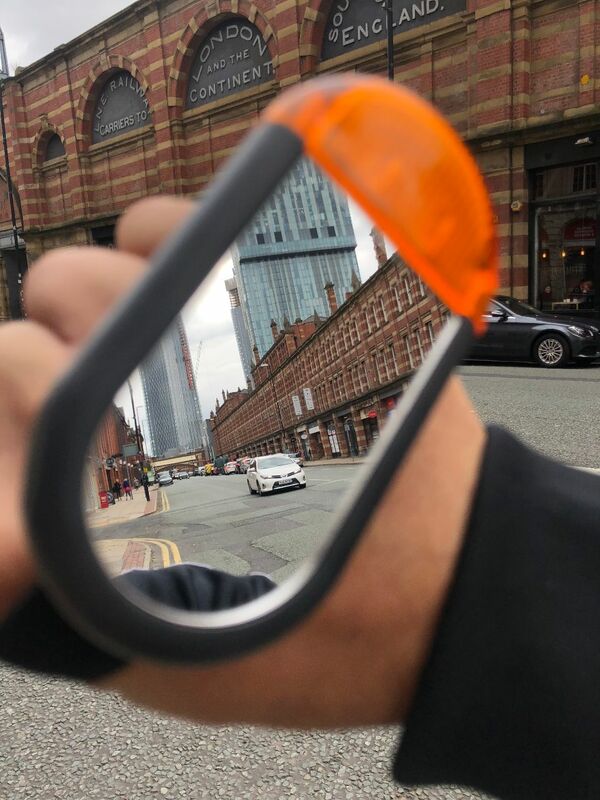 The field of vision with a handlebar mounted mirror is just too small for real confidence, using the wearable mirror you see so much more because it is so much closer to your eyes. You also lose the wobble less mobile cyclists get when they turn round to check traffic behind them,” adds Tolley. Making the indicator work safely and reliably took more time. “I spent a lot of time and money getting this right. Logically you’d think electronics could be made to recognise the movement of the right hand turn signal but whatever we tried wasn’t 100% reliable and that isn’t safe enough. Using a powerful magnet on the handlebars to switch the indicators on and off is more reliable and safer,” adds Tolley. The next stage was investigating the commercial potential of a wearable mirror and indicator. Market research from survey monkey spanned the views of some 250 consumers gathering first impressions, whether they’d buy one and so forth. The figures were so compelling they helped secure a £25 000 loan from Virgin Start-up in 2017 to help finance the company. Some of the motorists’ comments were also telling ‘As a motorist anxious for the safety of cyclists I've worried about the occasional difficulty of making out cyclists' hand signals at dusk and in poor weather conditions and would love to see lighting used in this way’ and ‘ Cyclists take no notice of cars whatsoever but I would buy one for my daughter as any additional safety measures she can have while cycling are a bonus and would probably help in an insurance claim if she was not at fault. Especially useful in places like London where there is so much traffic. Design, most manufacturing and assembly is all UK based. “We looked for suitable printed circuit board suppliers in the UK and that was the only element we had to outsource. Haverhill Mould and Tooling in Suffolk provides our casing and the quality of the plastics in the product and advice we’ve had in areas such as waterproofing the unit has been first rate,” adds Tolley. The Mi unit’s design is registered throughout Europe and both European and American patents have been applied for. The company is a member of the Bicycling Association and is a keen lobbyist for improving cycling safety. The ‘life saving manoeuvre’ is a central component for all motorcyclists to learn and master to get a license to ride on UK roads, also known as OSM PSL (Observe, Signal, Manoeuvre – Position, Speed, Look). This press release was distributed by ResponseSource Press Release Wire on behalf of Mirror Indicate in the following categories: Children & Teenagers, Men's Interest, Health, Leisure & Hobbies, Women's Interest & Beauty, Environment & Nature, Consumer Technology, Education & Human Resources, Transport & Logistics, for more information visit https://pressreleasewire.responsesource.com/about.